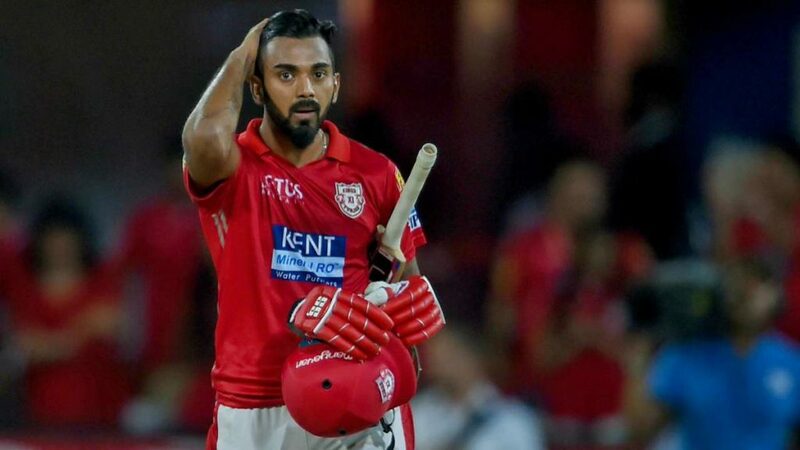 Lokesh Rahul and Mayank Agarwal scored fluent half centuries, as Kings XI Punjab defeated Sunrisers Hyderabad by 6 wickets in a nail bitting encounter at Mohali on Monday. Punjab included Mujeeb Ur Rahman, Ankit Rajpoot in place of Andrew Tye and Murugan Ashwin, while the visitors went in with an unchanged line up. After being sent into bat by KXIP, Sunrisers lost the in form Jonny Bairstow to Mujeeb Ur Rahman in the second over. The pair of David Warner and Vijay Shankar stabilized the innings by adding 49 runs for the second wicket, before the latter was caught by Rahul off Ravi Ashwin for 26. Mohammad Nabi who was promoted up the order looked good in his short stay, before he was run out unfortunately by Ashwin on his follow through. Warner and Manish Pandey brought SRH team back on track by adding 55 valuable runs for the fourth wicket stand, before the latter was caught by substitute Karun Nair off Mohammed Shami. The 32 year old Australian left handed opening batsman batted steadily and reached his fifty in 49 balls. Deepak Hooda’s late flourish at the end, helped Sunrisers Hyderabad post a competitive 150/4 in their allotted 20 overs. Chasing the target of 151, Punjab suffered an early jolt, as they lost Chris Gayle who fell to brilliant catch at long on boundary by Hooda off Rashid Khan. Lokesh Rahul and Mayank Agarwal put on 114 runs for the second wicket stand, before the latter who was dropped by Yusuf Pathan in the 16th over off Bhuvneshwar Kumar, was dismissed by Sandeep Sharma for a well made 55. In the same over, Sandeep changed the complexion of the game by dismissing David Miller. In the penultimate over, Siddarth Kaul claimed the wicket of Mandeep Singh to create some jitters in the dressing room. With 11 requiring off the final over, the 26 year old Karnataka batsman scored a boundary off Nabi in the fourth ball and kept their cool along with Sam Curran, as the home side won by 6 wickets and a ball to spare. Sandeep Sharma was Hyderabad’s best bowler as he claimed 2/21, while Rashid Khan and Kaul claimed a wicket each. KL Rahul was declared the player of the match for his brilliant knock. The 23rd match of the Indian Premier League will be played between Chennai Super Kings and Kolkata Knight Riders at Chennai on 9 April Tuesday.